Many of those who walk with a cane go through pains-taking efforts when they struggle to pick up something from a distance. Still in it's prototype-design and early development, the use of a "Cane-Grabber" combination is a practical solution to that common difficulty. Broomstick holding clips, typically used to attach items with a pole to a stationary wall are applied to the cane by drilling two small holes in the cane and securely attaching them with locking screws. The grabber than is clipped onto the cane. 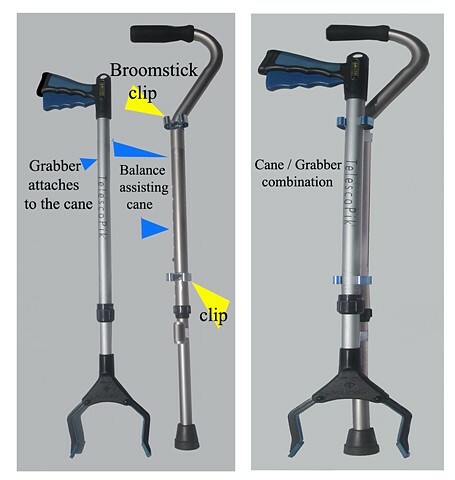 As someone walks along, the grabber can be employed by either sliding it down to the floor level while attached or removing it entirely to be used separately from the cane. This combined system could be applied to anything that is actively used for assistance, such as with a: wheelchair, scooter, walker, crutches, or any other assisting apparatus. I've used this combination and detached the grabber to help reach for items while sitting and shopping in a powered-supermarket-cart.